This slip is 39 inches long and has a drawstring waist that will fit up to 46 inches. This slip is made from 50/50 cotton blend. 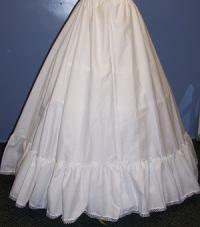 The circumference of the skirt is 150 inches and is made to fit over a 3,4,5, and 6 bone hoop skirt.This slip has a single ruffle at the bottom of the slip.